If you getting tired of everytime having to clicking Start menu and then click on Turn Off Computer, and then still have to click on Turn Off or Restart or Log Off in order to log off, restart or shut down your computer, and feel that it’s time wasting, you can create a one-click shortcut that allows the user to shutdown or restart Windows, or go into standby or hibernate mode, with just a single click on the shortcut itself. Best of all, the shortcut can be put at any place – desktop, Quick Launch bar, or Start Menu, and can even launch the shutdown or restart process from command line or command prompt. In order to shutdown or restart the Windows with just one click shortcut or from command prompt or command line, users can use shutdown command line utility/command that comes with Windows 2000 (with the Resource Kit installed), or natively in Windows XP, Windows Vista, Windows 7, Windows 8, Windows 8.1, Windows 10, all Windows Server and future versions of Windows. To access shutdown command, simply go to DOS command prompt by clicking on Start -> All Programs -> Accessories -> Command Prompt or Start -> Run and then type in Cmd to launch a command prompt window. In newer Windows after Windows 8, right click on Start button or bottom left corner to access Easy Power Access menu and select Run. To create a one-click shortcut to shutdown the Windows computer, right click on your desktop or any folder (or click at File at toolbar), and then select New, and then click on Shortcut. A New Shortcut wizard will ask for location of this item. In the textbox, type shutdown -s -t 0. Click on Next when done. When ask for a name for the shortcut, give any descriptive name you prefer, such as “Shutdown”. Then click on Finish, and you can now use the shortcut created to shut down PC immediately after click. 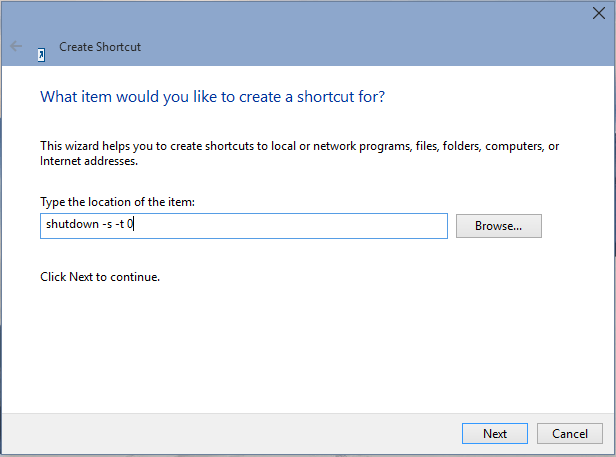 If you want to create a shortcut that quick restart the Windows instead of shutting down the computer, follow the above instruction, but “shutdown -s -t 01”, key in shutdown -r -t 0 for location of this item. Again, give a proper descriptive name to the shortcut, such as “Restart”, and the shortcut is ready to be used to restart the Windows right after click. In newer versions of Windows, the parameters can be specified through “/” instead of “-“. For example, shutdown /s /t 0. As in the shutdown command above, -s parameter will shutdown the computer, while -r will shutdown and restart the computer. -t 01 set the timeout or time to lapse in seconds for a shut down or restart to begin. By default, if no -t argument is specified, shutdown command will wait for 30 seconds countdown before shutdown or restart. The best part for shutdown command is that it can abort a system shutdown, by using -a as the option for shutdown, i.e. “shutdown -a”. There are other options or parameters that available, and users can view all of the flags with “shutdown /?” command at command prompt. If the timeout period is greater than 0, the /f parameter is implied.